The earrings measure 3.8cm from the top of the earwire to the bottom of the earring. 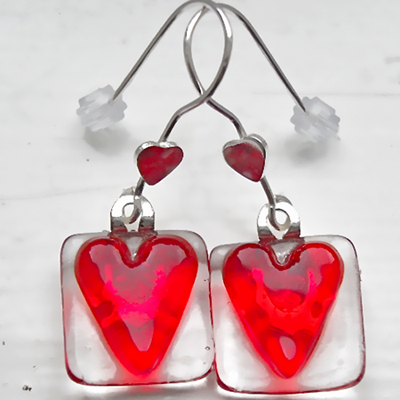 The clear glass piece is 1.5cm x 1.3cm approx, and the little Red glass heart is 1.3cm x 0.7cm. The earwires are Sterling Silver and have a very cute little heart, 0.5cm x 0.5cm, attached. They come in a Black card giftbox.